De Brazza’s monkeys spend their days foraging for fruit and socializing with others in their family group. Their digestive tracts, which are a lot like ours, make it hard for them to find nourishment in tough forest materials such as leaves and bark. De Brazza’s monkeys eat ripe fruit and seeds from trees, and occasionally other plant parts and small animals. De Brazza’s monkeys live in small groups in forests through Africa. They forage in the forest understory and floor, using long limbs and tails to move from tree to tree. De Brazza’s monkeys are sociable among themselves but hostile towards other primates. The one exception is colobus monkeys, with which they coexist peacefully, perhaps because they don’t typically compete for food. When threatened, they successfully hide by curling into a ball with their white parts hidden. In some localized areas De Brazza’s monkeys are disappearing as people destroy forest to make wood or farmland. On a broader scale, because they are so well camouflaged we don’t know whether populations are declining, stable, or on the increase. De Brazza’s monkeys chase off other monkeys that enter their territory—except for colobus monkeys. The two species’ digestive tracts are different, so they eat different foods and can coexist peacefully. De Brazza’s monkeys can swim. 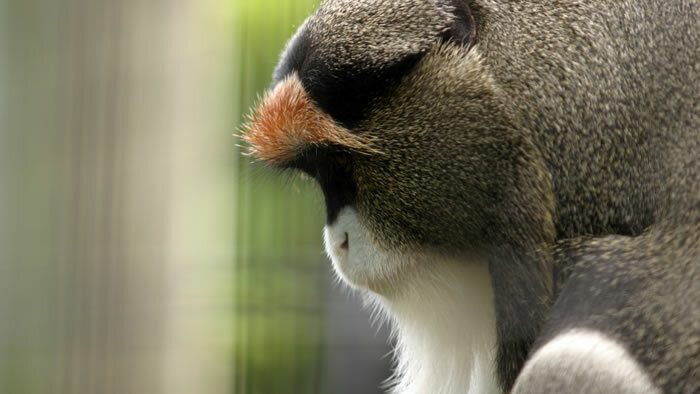 De Brazza’s monkeys store food in cheek pouches while they forage, then eat it later when they are in a safe place. 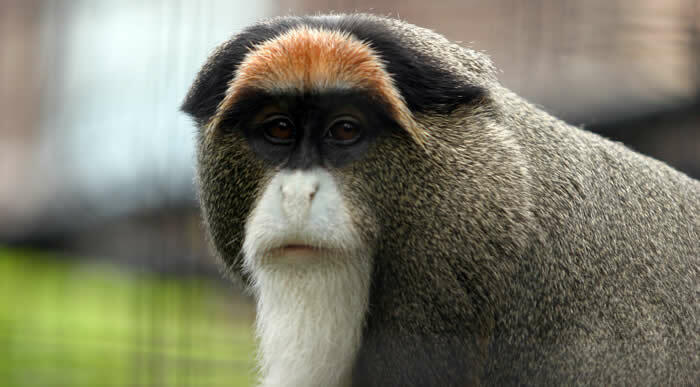 De Brazza’s monkeys are named for Pierre Savorgnan de Brazza, a famous Frenchman who explored Africa in the late 1800s. When threatened, De Brazza’s monkeys curl up into a ball with only their camouflaged backs exposed. They stay very still until the danger has passed—up to 8 hours! De Brazza’s monkeys do not appear to be in danger. However, in some places development is taking over their habitat, and occasionally hunters or farmers protecting their crops kill them. The Zoo has provided funds to support wildlife patrolling and monitoring on Bioko Island, Equatorial Guinea. Bioko Island is a small island (2000 km2) twenty miles off the coast of Cameroon in West Africa. It is home to the capital city of Equatorial Guinea, 150,000 people, and some of the most endangered animals on Earth. Threatened primates include: Pennant’s red colobus monkey (Procolobus pennanti pennanti: designated by IUCN’s Primate Specialist Group as one of the 25 most endangered primates in the world), the Bioko black colobus monkey (Colobus satanus satanus), Stampfli’s greater spot-nosed guenon (Cercopithecus nictitans stampflii), Preuss’ guenon (Cercopithecus preussi), Bioko red-eared guenon (Cercopithecus erythrotis erythrotis), crowned guenon (Cercopithecus pogonias pogonias), and the drill (Mandrillus leucophaeus). The island’s southern beaches are also nesting sites for four species of endangered sea turtles: the leatherback (Dermochelys coriacea), the hawksbill (Eretmochelys imbricate), the Atlantic green (Chelonia mydas), and the olive ridley (Lepidochelys olivacea). This project, run by the Bioko Biodiversity Protection Program, coordinates seven wildlife patrolling and monitoring teams in an effort to protect the island’s remaining wildlife and keep commercial bushmeat hunters out of protected areas. In 2008, the Minnesota Zoo provided funding through the Ulysses S. Seal Conservation Grant Program to help keep these patrols running.